Winter can be a tough time of year to fishing due to the weather and streams being closed but where ever there are rivers or streams open I take the opportunity explore and fish. 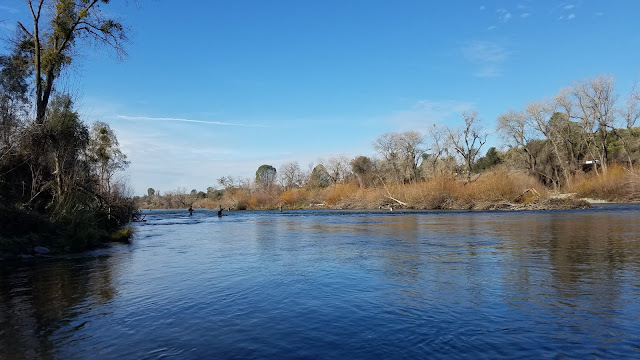 The Lower Yuba and Feather are the rivers I spend the most time fishing during the winter. Both rivers are about thirty minutes away and I have, for the most part, figured out their winter patterns and secrets. 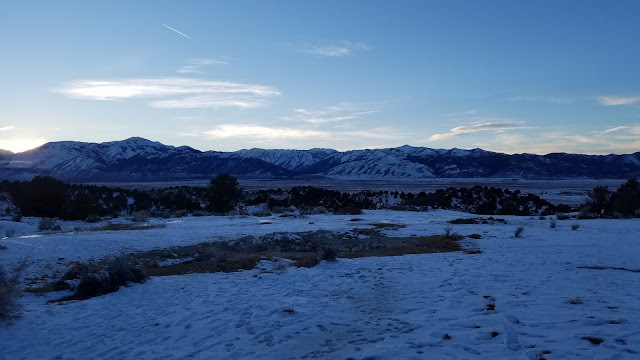 I will often try to make a few trips a bit further up north to fish Butte Creek for the solitude and possible wild steelhead. There's always somewhere to fish here in Northern California! Last year I avoided the Lower Yuba. The new changes the flood of 2017 brought really hampered my love for what I would consider my "home water." A lot of my favorite runs and flats above the bridge have been flattened out and though the river below the bridge remained relatively the same, many of the runs became deeper and more difficult to fish from the bank. 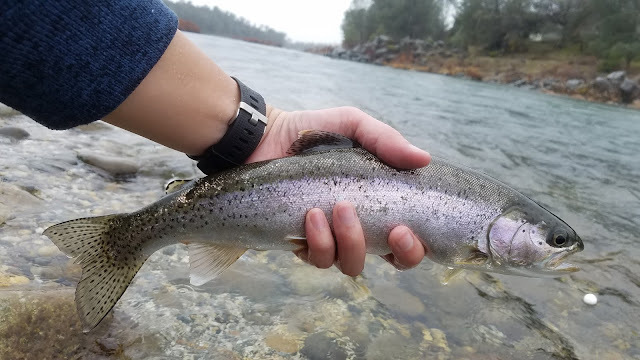 The only fish that seemed to have survived the catastrophic flood were smaller fish which left the Yuba full of hard fighting dinks. I probably only fished the Yuba five times last year hoping that if I left it alone things would return to the way they were prior to the flood. After a few visits to the Yuba this winter I've found that the fish quality has improved quite a bit. Rather than 6'' - 8'' dinks that were common last year I am catching the typical 12'' - 14'' rainbows. I haven't had much luck fishing around the new structure but I know there are fish there. The Yuba still has a lot of flat areas but I'm holding out that a few good winter storms will carve up some new productive nooks and crannies. I'm essentially relearning the river again but working with less can be disheartening. In comparison to the Yuba after the flood the Feather River hasn't changed much. The only riffles that I have seen change have been Outhouse, Mathews, Robinson, and Eye. With the exception of Outhouse riffle, all the other named riffles have been flattened out. The hatchery section opened on January 1st and I fished it on a Monday two weeks later. This section appeared to have been hammered by all types of anglers since it opened leaving much to be desired. I was surprised to see ten fly anglers fishing the main run and about six gear anglers above the hatchery pipe on the day I fished. Combat fishing just isn't for me especially if I plan on swinging flies. I left the hatchery section after covering water that didn't have people holed up in it and fished below the bridge. I ended the day with three hits and one quick-release. A quick-released steelhead on a swing is worth ten in the net on an indicator in my books. 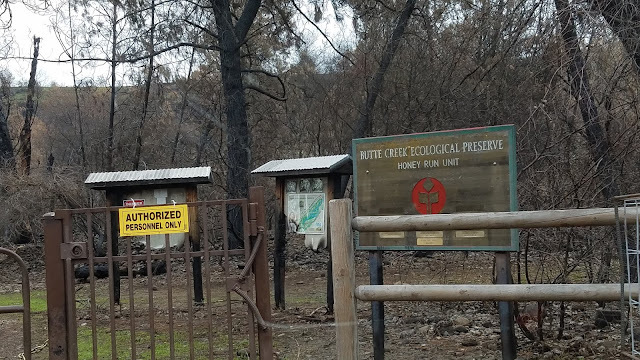 The devastation that was the Camp Fire left the Butte Creek Canyon a burnt mess. As I drove up to get to the area I could see the ashes of what was left of homes, fireplaces, and trees. I hadn't seen the fire's destruction yet and was mortified of what I witness. I left to fish the Feather in respect to the recovery of Butte Creek.